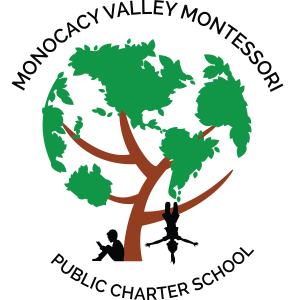 Monocacy Valley Montessori Public Charter School is the first charter school within the Frederick County Public School (FCPS) system. Attendance is open to all FCPS students. The school’s academic program is based on the philosophy and methods of Dr. Maria Montessori. The students, staff and families of MVMPCS are working together to create an enriching learning community. The Monocacy Valley Montessori School is a small, intimate and democratic learning community where children learn actively, think critically, and solve problems creatively. Students’ innate desire to learn is fostered using the Montessori approach: a prepared environment, hands-on materials, mixed age classes, and self-directed learning. We empower students to become responsible, confident, caring citizens who possess strong academic skills and an enduring love of learning.